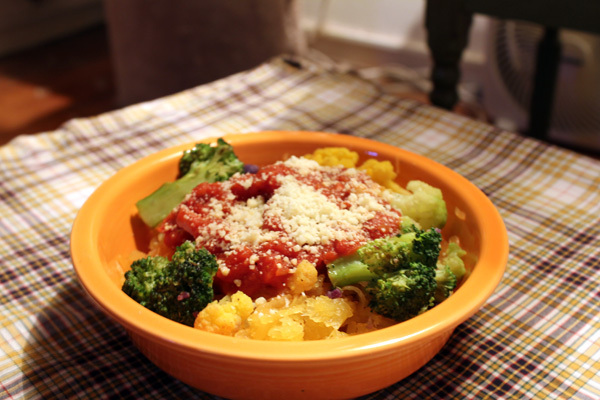 I still love spaghetti squash. I still have my cough and it made my walk home difficult. You see, I’ve vowed to walk to and from work on days when it is possible for me to do so. This usually means that every Saturday and most Sundays I walk home from work, then on Mondays (and Sundays when I am the closing manager) I walk to work. I live about 3.75 miles away from my job, so if I am consistent and walk the distance these three times a week, I walk 11+ extra miles a week. I also save $6 in bus fares. It’s a win-win, really. I got close to bailing out on this evening’s walking commute, however. I was carrying a heavy spaghetti squash from Trader Joe’s and I also knew that walking up the San Francisco hills were going to trigger coughing attacks. I knew the bus would be quicker, easier and would probably save me from the afore mentioned coughing spells. In the end, I decided that the squash wasn’t that heavy, it wouldn’t take that long and at least I would be coughing outside. Coughing in a confined space like the gym would be embarrassing, but outside is no big deal. It ended up being a really nice walk, despite the occasional hacking. I’m so glad I stopped off for that squash. I bought the squash and a package of broccoli/cauliflower mix. $4.43. I had the cheese and store bought sauce in the fridge. I’ll probably get another 4 or 5 meals out of the squash too. Who says eating well has to be expensive? Now that is good eats! Dinner tonight was boba tea with blueberry bread pudding. Don’t you love carbo-loading? 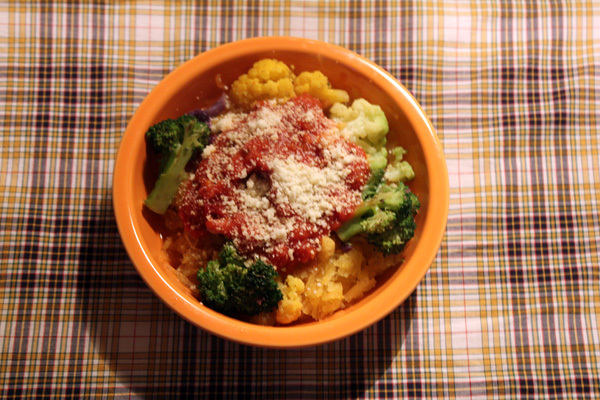 Though that spaghetti squash looks amazing too. Blueberry Bread pudding? Sign me up! Wow! I can’t believe you walk that much. I should try this. I work less than 3 miles from work and have never walked. Well, originally it started out that I would walk when I wasn’t in the mood to work out at the gym. Then it evolved into an addition to the gym thing. The way I see it is that it takes me 45 minutes to get to work on the bus…it’ll only take an extra 20-30 minutes to walk the whole way (that is including a Starbucks or Trader Joe’s stop usually), so if I have the time, why not?